If you follow Self-Help success stories, you might recognize Nana Manso. For the past decade, we’ve been privileged to witness and support Nana’s success as an entrepreneur. Beginning in 2008 with a microloan, Nana has continued to leverage Self-Help financing to build his business, most recently with a $520,000 loan financed in partnership with the U.S. Small Business Administration. Nana’s business, Skyrock Construction, specializes in all types of concrete construction—foundations, curbs, sidewalks—you name it. Nana first gained industry experience in his home country of Ghana. After he moved to the U.S., it was a big step to start his own business in Raleigh, especially in 2006 at the cusp of an economic recession. But Nana persisted. When he came to Self-Help in 2008, the company had revenues of around $50,000, and Skyrock qualified for a small business loan of $8,000. Since then, Skyrock Construction has grown into a multi-million dollar business with 16 full-time employees. 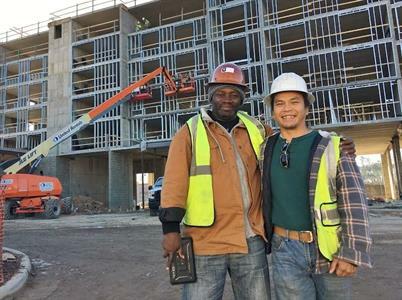 Some of the area’s large, well-established construction companies have come to rely on Skyrock’s quality work, and the company’s projects have included libraries, banks and hotels. Throughout Skyrock’s growth, Self-Help has been a lending partner. To date, we have provided six loans of increasing amounts as the company has grown. The most recent financing for Skyrock, just closed in December, was an SBA 504 loan. These loans, offered through the U.S. Small Business Administration, come with low down payments and attractive fixed interest rates. With the SBA loan and Self-Help’s partnership with First National Bank of Pennsylvania, Nana received a $520,000 loan with affordable terms. The loan will allow him to buy the property that the business has been leasing in Raleigh, giving Skyrock a permanent home that will build equity as the business operates.